Clothing pattern to fit 12" Marley Wentworth, Alice, Lyra and Agnes Dreary dolls. 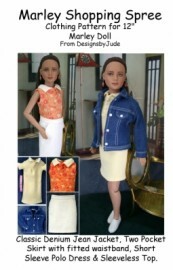 The pattern includes a classic denium jacket, polo dress, polo style shirt and two pocket skirt with a fitted waistband. Auction includes the pattern pieces, two pages on written instruction and photos of possible outfits. Pattern has been designed to use with cotton knits and light weight denium, collar ribbing and similar weight fabrics.